Jason… Do you have any surfboards? Very nice! When you heading down to Costa? Double overhead today at the good breaks. I’m excited to stay put for a bit. Anything over 8 feet starts to sketch me out. Where is all the skaties? About 3 feet to the right. Sweet Mother Of Surf Batman! I’ve never surfed before, at least not on a board. Only body surfed. It sure looks like a fricken blast. What surfing advice would you give a total noob, who really wants to learn? Michael, I would suggest http://www.virtualsurfcamp.com in about 7 days! Billy’s teaching skills are amazing. So happy to see that launching. Got a couple of sites that would be perfect for promoting it. Learn from Billy then come down to visit in Costa and I’ll show you the rest. So bummed, could not make it to the comedy show to see ya.. But hell I really thought about it. To the words of “its the thought that counts” however maybe we can paddle out some time.. Surf is up now. I just moved to Encinitas.. D street buddy. Good times. 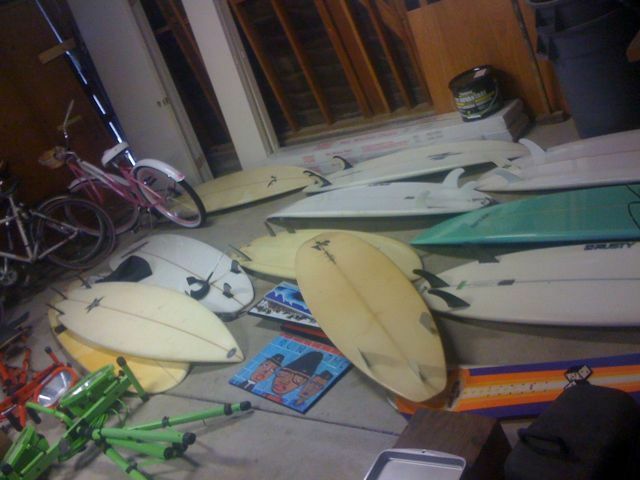 The land of Hippies, Dope, Yoga and ugly chicks..
Get pumped, you and your buddies will need to have plenty of boards. Your fix’n to ride the biggest wave of all time. Keep spinning your web and casting your net.